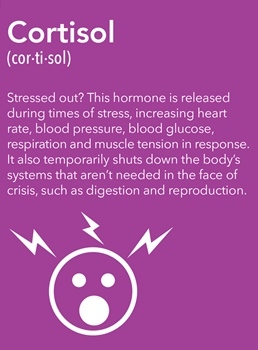 Cortisol is a stress hormone produced by the adrenal glands. Located in each kidney, the adrenal glands release cortisol in a rhythmic pattern throughout the day. Cortisol influences or regulates many of the changes that occur in the body due to stress including blood sugar levels, blood pressure, immune responses and anti-inflammatory actions. Cortisol also metabolizes fat, protein and carbohydrates to sustain blood glucose levels. The release of cortisol is regulated by the pituitary gland in the brain and is active during times of both internal and external stress. Cortisol is protective and helps to activate, defend and protect the body. However, the protective effects of cortisol can often occur at the expense of other functions in the body, especially when cortisol levels remain exceptionally high or elevated over a period of time, which is often a result of chronic stress. The best way to battle the adverse or negative effects of cortisol in the body is through daily stress management. Some good examples of daily stress management include doing something you enjoy, such as a hobby or creative activity, meditating or taking part in an exercise class you enjoy, whether it is gentle or rigorous. What are the effects of cortisol in the body? Cortisol is really great for containing and controlling internal inflammation. Cortisol-based medicines are often used to treat asthma, lupus and some forms of arthritis as well as types of cancers that effect the immune system. However, higher and more prolonged levels of circulating cortisol, especially those associated with chronic stress, have been shown to have negative effects such as blood sugar imbalances, decreased muscle mass, sleep deprivation or disruption, lowered immune functions, slow wound healing and problems with thyroid function. Increased abdominal fat is also a negative sign of higher levels of circulating cortisol and can lead to more serious health problems such as heart attacks, strokes, lower levels of good cholesterol and higher levels of bad cholesterol. Brain fog and impaired cognitive functions are also signs of too much circulating cortisol. We know that cortisol plays an important role in the body’s 24-hour cycle as well as defending the body during periods of acute stress. This is normal and natural, however, when stress becomes chronic and cortisol levels remain elevated for a very prolonged period, cortisol can compromise the overall body functions as a whole, especially suppressing the immune system and creating hormone resistance. All of this can lead to diabetes, insomnia, weight gain, fatigue and exhaustion. It is important to combat stress to keep cortisol levels regulated and to keep us healthy. Daily stress management can help keep cortisol levels in check. Breathing techniques, yoga, meditation and conscious relaxation reduce cortisol levels. Take advantage of daily stress management ideas, breathe deep and keep your stress hormone cortisol in check. It is easy to manage your stress at Santosa. 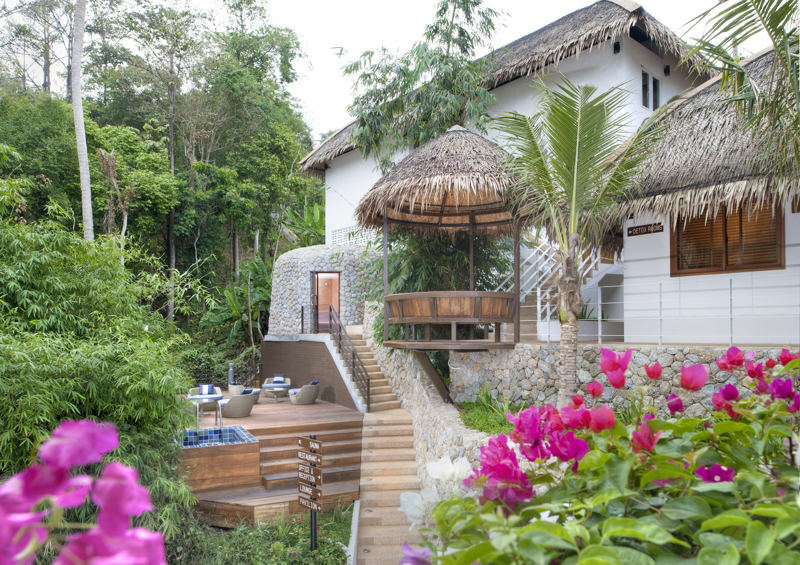 Set amongst a jungle-clad hillside, Santosa is a serene wellness retreat on the island of Phuket in southern Thailand. If you are looking for daily stress management activities, Santosa offers yoga, breathwork, meditation and the chance to pamper yourself with a massage. Our One Day Detox, One Day Relax and Spring Clean programs aim at reducing stress and rejuvenating the body. If you are feeling overwhelmed and looking to eradicate stress from your lives, come spend some time with us and slow down. For further information, simply fill out the inquiry form below. We are looking forward to welcoming you to Santosa Detox & Wellness Center and helping you get on a healthy journey.